Halcombe has received a very positive review in the United States which can be enjoyed in this post. My book the Adventures of Halcombe Norilsk and other gripping tales is available worldwide. the adventures of Halcombe Norilsk and other gripping tales (Read this in Spanish) crítica the adventures of Halcombe Norilsk and other gripping tales It has received 4 stars out of five. The Adventures of Halcombe Norilsk is a dryly funny account of self-discovery. 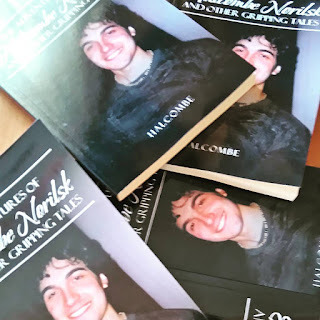 Halcombe’s The Adventures of Halcombe Norilsk is a memoir about one man’s dreams, shared in a series of humorous and often mocking essays exploring desires for fame and inspiration. Essays regarding Halcombe’s life are framed as if he’s a folk hero. He travels and explores various career avenues, including those of a musician and a politician, hoping to become well-known. These adventures lead to his most significant chance at greatness, when he sends his manuscript off to a publisher. His self-referential writing weaves into the essays that follow, which range from autobiographical to his personal thoughts on topics such as pop culture. The “gripping tales” that follow continue to break the fourth wall. They include things such as a list of ways to fall asleep, with reading “this book several times until midnight” thrown in. Topics that are more thoroughly analyzed, such as an essay on the origins of Metallica, have a more polished and researched feeling than do such lists and reflections on the basic enjoyment of life. All essays considered together, it seems clear that this is a collection meant to be enjoyed and taken lightly. Essays in the second half cover a wide variety of pop culture and inspirational topics that function through exposition instead of action. Halcombe writes about celebrities—all of whom connect back to him, thanks to their shared desire to be famous. While achieving fame is a motivating force within many of these essays, ways to earn such success peek through as their greatest lessons. Carlos Raposo, Halcombe reflects, earned a large salary playing Brazilian football “without knowing how to play the game.” A series of success stories—as well as stories of other people’s failures—follow, indicating that hard work and inspiration can sometimes, if not always, lead to success. The writing style varies between essays. Some get right to the point; others use more descriptive language. At times, language is humorous and witty. Tones are made to match their topics—sorrowful, snarky, or inquisitive as is necessary.